The video showed the fear and shock experienced by Levine when he was surprised from behind, and his ultimate attempt at grace as the semi-inebriated lass was led off by security. Her amorous embrace apparently resulted in cutting his ear. The boy obviously forgot how to “move like Jagger”. It is ironic to think that this is a group who had a recent big hit, Animals, that contained the lyric “Baby I’m preying on you tonight/Hunt you down and eat you alive”. Incidents like this are probably mildly amusing to the general public. To me, having spent most of my adult life hosting crowds and facilitating mass-gatherings, it strikes a very different chord. It is what has kept me awake at night. I take the responsibility of this “business” quite seriously. I feel I owe the patron of my events [notice I used the word “my”] the obligation to keep them safe. This goes for artists, athletes, ticket-buyers, event staff and anyone remotely associated with the assemblage. I “own” the event and the concomitant obligation to keep the participants safe from injury or illness. This is a core value for me and those colleagues of mine who share my views. READ SHIN SPLINTS REDUX - Make it Hurt! In April of 1993, in Hamburg, Germany, an incident took place at a tennis tournament that radically altered the paradigm of crowd management at sports and entertainment events. Monica Seles, a gifted, multiple Grand Slam singles winner, was seated while taking her rest between sets during her match with Magdalena Maleeva. She was a naturalized American citizen, having been born and raised in Novi Sad, Serbia in Yugoslavia. She was approached and stabbed in the back between her shoulder blades with a boning knife. Her assailant, Gunter Porche, a deranged fan of her rival Steffi Graf, wound up getting only two years of probation. Seles was never the same after her healing. She ultimately won almost $15M in career prize money and was elected into the International tennis Hall of Fame. However, the assault cut her career short and she resides today in Sarasota, FL. It seems like there is always a music “backstory”. During her hospital stay, an obscure rock band from Melbourne, Australia, called The Young Elders, wrote and recorded a song titled “Fly, Monica, Fly”. They sent Seles a CD of it and she publicly credited the song in aiding her recovery. The band went on to change their name to The Monicas. Since the Seles attack venue managers have become far more sensitized to the need for keeping patrons separated from the acts and the athletes. A regrettable violent incident at an NBA game at the Palace in Auburn Hills, MI, only exacerbated this tenet. Members of the Detroit Pistons and the Indiana Pacers wound up in the seated areas in a physical confrontation with fans. As I watched the news coverage of the Adam Levine incident I was reminded of a similar circumstance that took place over 30 years ago. 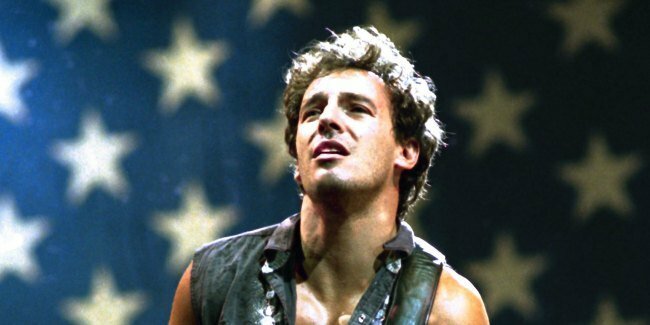 The rock-and-roll legend, Bruce Springsteen, produced a seminal album, titled Born to in the USA, in 1984. The first single off the record was “Dancing in the Dark”; to this day one of “the Boss’” most enduring hits. When it came time to produce the Musical Video of the song, Springsteen and his business muse, Jon Landau, came up with a brilliant marketing idea for his brand. They decided to film actual concert footage of the song, which ultimately was created at a show in the St. Paul, MN, Civic Center. As the first chords of the song began, Springsteen looked out in the audience and pointed to a pretty girl and pulled her up on stage to dance with him. It was the real-life answer to the fantasies of his legion of female admirers. The girl in the video was actually the aspiring actress, Courteney Cox [now Arquette]. Many now know her as the ditsy Monica Geller on Friends, or Gale Weathers on the Scream episodes, or, more recently, the predatory Jules Cobb of Cougar Town. Springsteen took his E Street band on tour to promote the record. At every show, in every city, they played the song and invited some pulchritudinous young thing on stage to dance with him. Every night it was the second song of the second set. And, every night he was sending out the not-so-subtle message that it was OK for the audience to mingle on stage with the artists. And, it drove those of us in the crowd management business crazy. We were left to cope with the spate of “copy cats” at other concerts where their presence on the stage was not wanted, and where there were a multitude of dangerous situations. As his career progressed, Springsteen ultimately dropped “Dancing in the Dark” from his concert playlist. I think he avoided the tune for over 10 years. Finally, in 2012 he resurrected the song in his live performances. But, in the Courteney Cox role, he substituted his mother, Adele. In recent years, the dancer has been his daughter, Jessica.